Golf, the game of a lifetime everywhere in the world! What make golf so popular and fun? Many people think that the game of golf is for the rich, 'upperty', corporate executives etc.. Well, this statement was true 30 years ago. At that time playing tennis was also hard to come by. This is however no longer the case today! There are many public practice ranges today as compare to the one and only at East Coast of the island 25 years ago. Golf is the 'in-thing' and talk about at present! There is an enormous demand; for golf ranges. In Singapore, there are approximately 13 practice ranges open to the public. The extravagant highlight of this special game is the enormous beauty of golf courses. Golf is played in the open field we call the fairway starting from tee and ending on the putting green. You can play in the morning to enjoy the cool and fresh air; in the afternoon if you like the sunshine; in the evening to experience the tranquility. Every fairway is landscaped and designed characteristically different. Some of the most beautiful holiday resort in the world has been made more attractive by over laying with the exquisiteness of a finely manicured golf course. Be it by the ocean, in the mountains, among sparking lakes and streams, or over rolling plains and farmlands, the beauty of golf is truly breathtaking. The challenge of these varied terrains is never ending. The scenic design and the lush greeneries can be so beautiful in some great golf courses that you will long to go back to play again. No other game provide such an outstanding environment. Every golf course is different and no two golf courses are alike. Most golfers likes to play on as many courses as they possibly can to enjoy the unique design and architecture, especially the signature golf holes. Golf enthusiastic will even travel to the neighboring countries to experience the courses and some will go as far as China and Australia to experience the "air condition-like" weather which you can never experience in Singapore. Who and where you play with also account for the golf outing satisfaction. The individual crazes and fantasies are endless…. The golf swing is the most amazing physical expression of a golfer. To some golfers it can be the most recreational but to other is almost like a very laborious workout. The swing requires a golfer to move the proper group of muscles in the body in perfect co-ordination. To the advance golfers they will tell you an efficient swing require a good mind-set. To the social golfers they may tell you that it is easier to get a Bachelor in Science degree than a perfect golf swing. The opinions are endless. The problem is not just how you swing the golf club on the golf ball but more on how you can swing consistently all the time to propel the golf ball to your target. Where can I get started to learn the golf technique? The sure productive route to attain the essential fundamental of a golf swing is to see a qualified and experienced teaching professional. Golf teaching professionals are available in most practice ranges. They conduct clinic classes for small and big group, individual classes as well as special personalized lessons and training programme. Group classes are beneficial for friends that would like to start up together. Individual lessons and personalized lessons are one-to-one coaching for those who want undivided personal attention. Choosing the type of class is dependent on individual's personality preference. It is also wise to find out more details about the lessons and learning outcomes before sign up. How would I know which is the best Golf Teaching Professional to start with? First, you need to start with a golf teaching professional that can communicate with you at your level. Therefore you must assess him or her when meeting up for a brief presentation of the lessons that you will be going through. Some may like the teacher to be more introvert, other may prefer them to be extrovert. This is very subjective. Do ask about his teaching certification, methodology and testimonials. Some may ask their golfing friends for their experiences and opinions while others may want to see the teacher hands-on teaching in a class. Most importantly, the teaching methodology must meet your learning styles (auditory, visual, kinesthetic and experiential). Good teaching professionals possess high passion, dedication and commitment in their work. How much do I have to pay for learning the golf technique? Group classes can cost as much as S$400 to S$1,000 per person depending on group size, lesson contents and which golf teaching professional you choose to start with. The difference in the cost for the group package will also depend on the number of lessons (there can be 6 lessons to 20 lessons per programme). The duration for each lesson can be a 30-minute, 45-minute or 60-minute. Individual and personalised lessons can cost from S$90 to S$150 per lesson. Most golf teaching professional will encourage the potential golfer to sign up for 6 to 10 lessons for starters or/and beginners of individual lessons to acquire to full knowledge of the golf swing technique. Choose one that you feel is value for money. It is not necessary that more lessons in a programme and package is better – it is the teaching methodology and instructional quality of	the lesson that counts! When can I start playing on the golf course? A golf course designed for competition is approximately 6,000 to 7000 meters and a flight of 4 golfers will take approximately 4 to 5 hours to complete a social game. In order to play a game of golf on the golf course for the first time, the golfer would be required to achieve a certain skill level for the golf swing technique. The primary skill the golfer must possess is to be able to hit and airborne the ball toward the target. The distance of the golf ball traveled is secondary. This primary skill requirement is known as swing 'Proficiency'. A golfer needs to attain a 'Proficiency Certificate' in order to play on the golf course. As many golfers are playing on the course, and in order to ensure that all golfers are enjoying their game, it is therefore imperative that each and every golfer possess this swing proficiency. This is to ensure that no one golfer will be likely to slow down the game, thereby causing other golfers not being able to finish their game on the course in time. Moreover, if a golfer is hitting the ball everywhere, it may endanger other golfers on the course. In some golf courses producing a Proficiency Certificate and Handicap Index Card (official golf playing skill level) is mandatory prior to playing. Where can I take a golf Proficiency Certificate Test? 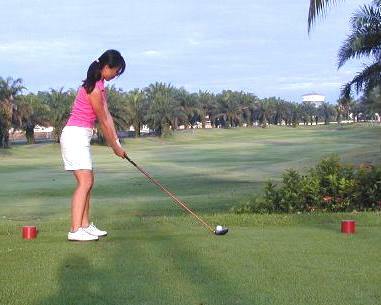 In Singapore, there are practice ranges and golf courses that conducts the golf 'Proficiency Certificate Test' for the golf beginners. Upon passing this test, a Proficiency Certificate (PC) Card will be issued to the individual. The Proficiency Certificate Test would also require the golfer to know the etiquette and rules of the game. Etiquette is the long established procedures and customs about the game is played. Other aspects of the game's etiquette are courtesy, safety, responsibilities, consideration for other golfers and care for the golf course. A golfer must exhibit the swing consistency, know how to behave and conduct oneself orderly on the golf course. The test requires the golfer to play a few holes on the golf course to prove their golf technique competency. The Proficiency Certificate (PC) Card can usually be used where it issued. The Executive Golf Course, a public golf driving ranges conducts this golf Proficiency Certificate Test. Some golf courses require golfers to produce PC Card before playing on the golf course. On the contrary there are also many resorts with golf courses in the world and especially in the neighboring countries that are open to walk-in public for them to enjoy a game of golf. These golf courses may not require golfers to produce a PC Card or the Handicap Index Card. Is there a golf attire required for playing golf? It is mandatory that all golfers are properly dressed for their game in all golf courses. The basic attires are, collared T-shirt with pants or shorts within 3 inches of the knee, and golf shoes with socking. Ladies may allow skirts within 3 inches of the knee. Always dress well, look good and feel good for your practice and play. At Asian Golf Centre we provide: golf lessons and special personalised training for starters/beginners to acquire the proficient golf swing technique and game requirement; for golfers who are seeking for skills and game improvement; and preparing golfers who are looking forward to take their Proficiency Certificate (PC) and Handicap Index Card tests.